Undeterred I headed out at 6:40 with my phone to navigate and a rough idea of where I was going. 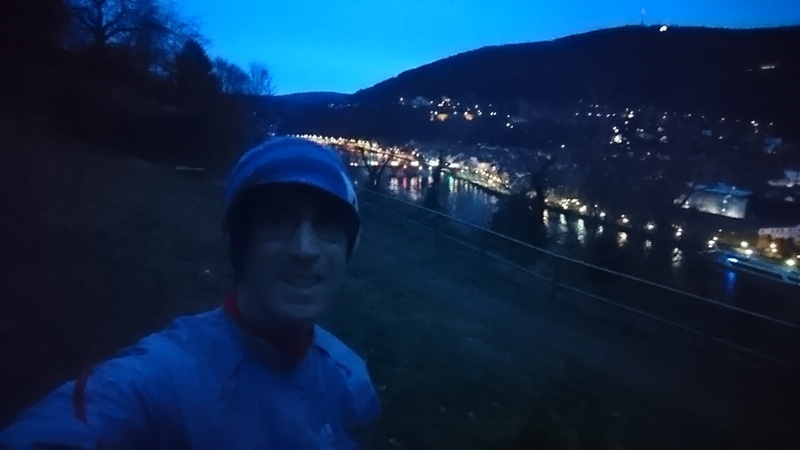 I began with the flat, easy run along the banks of the Neckar towards the city. All was silent on my side of the river but there was the occasional car on the highway on the opposite bank and there were city sounds drifting down the valley towards me to blend with the birdsong in the wooded suburbs. Google maps, my best friend and enemy, showed an uphill route heading up the hillside to the Philosophers Garden from roughly the end of the old bridge (Alte Brucke). The bridge came up soon enough, an relic from Heidelberg's past with its arches. cobbles and statues. Last time I had crossed it had been on the final stretch of my epic ride from Bristol to Pujaloy last June, but this time I was heading in the opposite direction. The path was easy to find and turned out to be a narrow and dark cobbled alleyway steeply climbing up from the river. Out came the phone with its flashlight and I puffed my way up - it reminded me of my old fell-running days, half-walking and half-running on the steep ascent. The Philosopher's Garden was silent in the ghostly, pre-dawn light, all its statues wrapped up, presumeably to protect against the frost. The views were lovely, despite the darkness, the lights of Heidelberg shining between the trees and reflecting in the river. From there I pushed on right into the city on ancient streets, turned down to the river and made a tempo-run of the return journey. 58 minutes in total, I'd judged it just right - giving myself time for shower and breakfast plus a clear 2 hours to assimilate that before the main event - 2 hour silent meditation at 11. Which was, as you can imagine, beyond description.